I just got back from my annual driving trek from Seattle to San Diego and back. We had lots of fun at the beach, various amusement parks, fairs and the like (including actual (albeit fruitless) fishing!). But right before I was to start the drive to San Diego, I got the very sad news that my grandmother passed away and I made a whirlwind visit to Colorado and Wyoming to attend her service. My grandmother was 103, so while her passing wasn't that much of a surprise, it was very sad. Her name was Low Shee Hing. I called her "DoPo," which is Chinese for "Maternal Grandmother." She was born in southern China and came to the US as a mail-order bride. 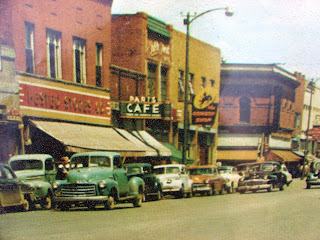 She and my grandfather ("Do Goong") eventually settled in Laramie, Wyoming and Do Goong opened the Paris Cafe. The Paris Cafe closed when I was a baby, but the stories about it from my aunties, uncles and cousins are myriad. The Paris is now a real estate office but the bakery next door is the same from the Paris days. Mom remembers a window between the two establishments where they could pass freshly baked rolls back and forth. The grainy picture above is a photo of a photo I took at the Bakery. It was very special to visit Laramie again with my family. I have many happy memories of visits there. Some of my favorite memories are eating Kentucky Fried Chicken at Dopo's table with all the aunties and uncles and cousins, listening to the mix of english and chinese along with the aunties' cackling laughter. I also remember making rubbings of DoPo's plastic lace tablecloth and wavy plastic carpet protectors - such things could only be found at DoPo's house. DoPo was also a remarkable seamstress. She sewed all of her clothes from her own patterns. Mom told me that DoPo could look at a garment in a store and then go home and recreate it from memory. I'm sure my love of sewing is due to the influence of my Mom and DoPo. I've told the kidlings that when they have their own children, I'd like to be called "DoPo." I hope that I'll be able to pass on some of the love, creativity and tradition I was lucky enough to get from my DoPo. Thank you for everything, DoPo, and ho ho chan! So sorry to hear about your grandmother. Seems as though she was an awesome DoPo. :) Thank you for posting the picture as well. My family and I stayed in Laramie many years ago on our way from California to Kansas. The picture looks just as I remembered.